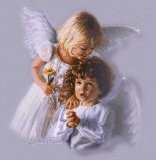 God’s Tiny Angels ~ Crafting handmade items to donate to hospitals caring for needy babies. Volunteers give clothing to help. Every day across the world there are babies born ill or in need. Approximately 1 in 9 of these babies are born premature, affecting nearly 500,000 families every year in the United States alone. And some of God's babies have little more than a tiny diaper on. Imagine what you could do to make their new lives a little warmer! Our home on the web has been blessed by others that have sewn, crocheted, quilted, knitted and even went out to yard sales for the little ones. God's Tiny Angels is an all volunteer group that provides items to Cabell Huntington Hospital in WV and elsewhere across the country, to the parents for free. Help make a difference today. Tomorrow will bring more of God's Tiny Angels.
" Today is the tomorrow you worried about yesterday." "God took care of yesterday, why not let Him take care of tomorrow?" About Us ~ Learn about how we began and what we are doing. Hospitals ~ Learn about the facilities we are donating to. Join Us ~ Learn about how you can help, what is needed, and where you send your donations. Photos ~ Photos of past donations. Free patterns ~ Links to free patterns for charity use only. Home - Gods Tiny Angels - Crafting handmade items to donate to hospitals caring for needy babies. Members sew, crochet, and knit.